The merest mention of Moog's analogue Moogerfooger effects line is guaranteed to make FX nerds salivate lustily, and the latest processor from the stable looks set to be no exception. "The Cluster Flux is an ultra-powerful and flexible, sound-sculpting tool for use live or in the studio. Expansive functionality combined with warm, analog sound come from the state-of-the-art all-analog circuitry. "Musical, flexible, playable, and durable, the Cluster Flux is capable of providing classic flanging, chorusing, and vibrato effects, but is also capable of a much wider range of modulated delay line effects than traditional stompboxes in this class due to the wide range of the front panel controls, the multi-waveform LFO, as well as CV and MIDI Control. "The MF-108M Cluster Flux is more powerful than traditional chorus/flange effects offering musicians the added modulation of multiple LFO waveforms: Sine, Triangle, Square, Saw, Ramp and Random, to create many kinds of new modulated BBD Delay effects. MIDI IN allows control of Delay Time, Range, Feedback, Output Level, LFO Waveform, LFO Rate, LFO Amount and Mix." The MF-108M Cluster Flux will be available in Autumn 2011 for a MSRP of $599.00 USD. 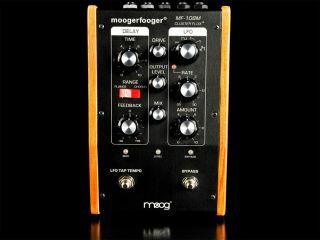 Visit Moog Music for more.